There are many ways to enjoy beets. Shaved over a salad, grated and used in wraps and sushi, juiced, or blended with hummus or pancake batter. Many people don’t realize that this root’s green top is also quite edible. I like beet greens sautéed in a little evoo, garlic, and salt. Although you can easily find beets canned or even vacuum packed, they are just never as good as freshly roasted beets. These hard roots become tender and sweet after spending some time in the oven. Although they take a good 40 minutes to cook, the actual work is short and sweet and roasting is the easiest way to peel these little gems. I like to roast a big batch of beets and use them throughout the week in lunch boxes, salads, and dinners. Beets aren’t just delicious and pretty to look at. They are also incredibly nutritious. 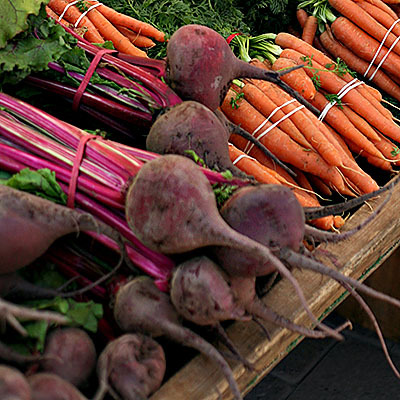 Beets are great immune system boosters, as they are high in Vitamin C and other minerals. They are also high in folate, which is important for pregnant mamas. So let’s get to roasting! All you need is one ingredient, some foil, and an oven. It’s that simple! Sometimes I roast our beets in a Dutch oven, but roasting beets in foil means there are absolutely no dishes. And personally, I have more than enough of those. You have got to see how easily these skins slide off! Use your beets in this beauty of a salad! The easiest way to roast and peel beets. Divide cleaned trimmed beets between two or three sheets of tin foil and wrap up into pouches. I like to place a baking sheet under the beets in case juices drip out. Roast beets for 40 minutes. Carefully unwrap a portion of the foil and poke a beet with a fork. If the beet is tender, they are finished! Allow beets to cool enough to handle. Peels should slip right off, but a knife will remove any tough bits.